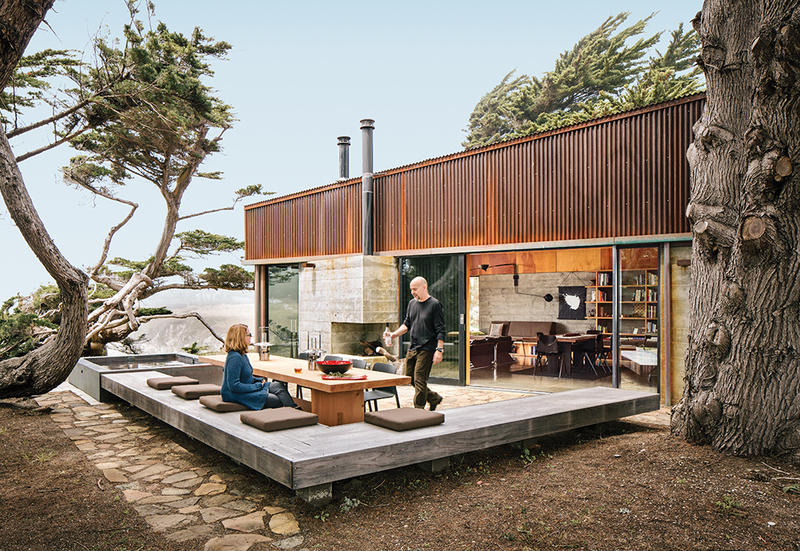 Ramirez and his partner, Sarah Mason Williams, dine at a sequoia table by Redwood Burl next to a hulking juniper tree that they asked the architects to preserve as a centerpiece of the property. 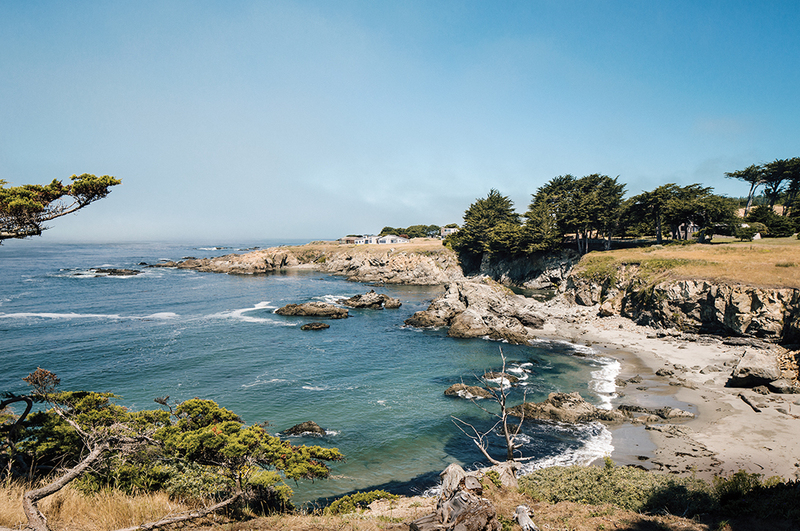 The view from Gabriel Ramirez’s property in Sea Ranch, California, where meadow grasses and cypress trees give way to craggy cliffs and the lapping Pacific Ocean. His house joins those that a cohort of forward-thinking architects built along this stretch of coast in the 1960s. 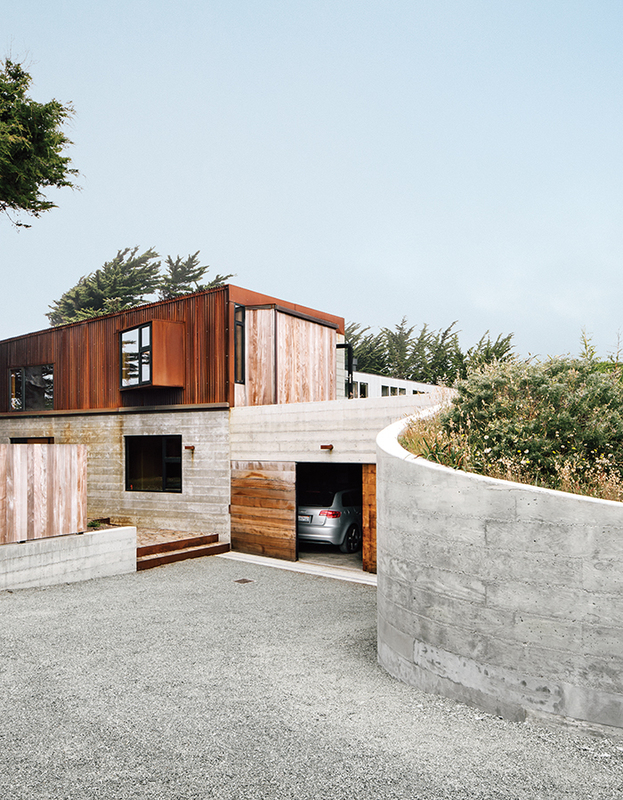 Cor-Ten steel and board-form concrete give the exterior a weathered look. The living room is furnished with vintage items, including a leather-and-chrome chair by Suekichi Uchida and a stacking stool by Florence Knoll. Boi sconces, which David Weeks designed for Ralph Pucci, illuminate the bedroom. The area rug is by Stephanie Odegard. Sea caves on the property forced the architects to split some of the living space into a 483-square-foot guesthouse. The guesthouse has similar built-ins and is outfitted with a reproduction rotating sconce by Serge Mouille and rugs by Stephanie Odegard. The owner is Gabriel Ramirez, a radiologist who lived for 20 years in a Richard Neutra house in Los Angeles and commuted to area hospitals. But now that technology lets him review scans remotely, he prefers to work in quiet, isolated Sea Ranch. After buying a site overlooking an inlet called Smuggler’s Cove, he asked two architects—Norman Millar, dean of the Woodbury School of Architecture, and Judith Sheine, head of the architecture department at the University of Oregon—to design the house. The architects had never worked together but had similar modernist credentials, and both are close friends of Ramirez, who didn’t want to have to choose between them. “We’re like a family,” says Millar, who adds that Ramirez made it clear that the architects would always be welcome in their creation. Sea caves located beneath the property presented a problem: The house couldn’t occupy the center of the lot but rather had to hug its edges. By all accounts, that challenge proved beneficial by forcing the architectural duo to create two structures, a modest main house and a guesthouse, rather than one big one. This was fine by Ramirez and his partner, Sarah Mason Williams, a graphic designer. In true Sea Ranch fashion, they wanted the giant juniper at the center of their property to remain the site’s dominant feature. Indeed, the interiors recall both Moore’s loft, with its raised bedroom, and Esherick’s houses, with their stepped interiors. In Ramirez’s version, the living room, dining area, and kitchen are closest to the bluff. A few steps lead up to a guest room and study, and a few more lead to the master bedroom. The only enclosed rooms are the bathrooms, which project out in ipe boxes from one side of the house, and Ramirez’s office, tucked away below the master bedroom. 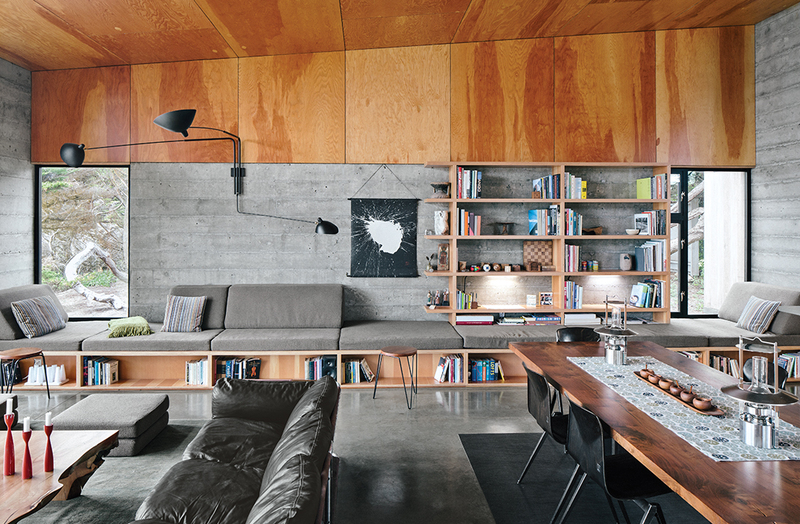 The spaces flow into each other under an angled ceiling made of richly hued plywood—which, Sheine says, makes the interiors “warm, warm, warm.” On the sidewalls, everything above the datum line is covered in the same plywood; everything below is concrete, with grooves and pits that seem appropriate to the rugged surroundings. No part of the house is drywall, which Sheine describes as a kind of crutch—the material of last resort.